This is the Challenge Society faces today. As McKenna says, I consider myself “…a Self-Appointed Artist”. Thru my travels and studies, researching the topics and interests in History, Academics, Economics, Modern Culture, etc. I have adopted Terrance McKenna’s challenge and have taken it to heart. The JobSpectrum™ is the accumulation of one of an infinite answers to this Daunting Challenge. In my mind, the JobSpectrum™ is already a success – it makes so much sense, and it is a gift from the infinite. The Challenge of the JobSpectrum™ , which is as equally as daunting, is to be able to get what is theory and convey it in a way that is understandable to the masses. There are a Myriad of Positive Aspects and Atributes the JobSpectrum™ will unlock for society. Even though it seems like there is no way out of the mess Civilization has put itself, all possibilities exist, and anything is indeed possible. That being said, it is never too late to start. 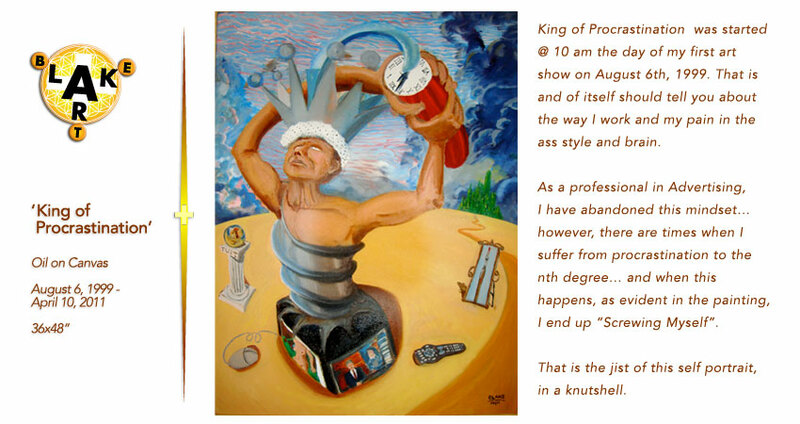 ‘King of Procrastination’ Oil on Canvas 36×48″ August 6, 1999-April 30, 2011.